Blog Is a motorized scooter or wheelchair a motor vehicle? 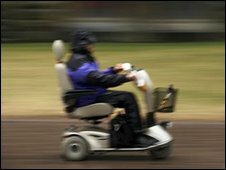 Is a motorized scooter or wheelchair a motor vehicle? In general, motorized scooters and wheelchairs are a benefit to people who would otherwise be immobilized. However, they also create some legal questions as to how the rules of the road apply to them. At about 1:15 in the morning, Peel Regional Police officers observed the defendant operating a personal mobility device on Bramalea Road. He was travelling from curb to curb in the southbound lane impeding traffic flow. The police had difficulty getting the defendant’s attention and were unable to get by safely because the defendant was weaving from curb to curb while seated on the personal mobility device. The police followed the device driven by the defendant about 150 metres. The police had their emergency lights and siren on. The police officers also yelled out of the window of the police cruiser for the defendant to stop. The personal mobility device driven by the defendant at that time was owned by his mother and had been borrowed by the defendant. The defendant has had hip and neck surgery which restricts his ability to walk for distances greater than 100 to 150 metres at a given time. this device is drawn, propelled or driven by means other than muscular power which is the very definition of a motor vehicle in section two of The Criminal Code. However, despite the finding that a motorized scooter is a “motor vehicle” under the Criminal Code, riders of these vehicles have been treated as pedestrians when they are struck while in a crosswalk (Forbes v. Wilkinson, 2005 BCSC 1936) or on a sidewalk (Falconar v. Le, 2003 BCSC 1434). These cases imply that a motorized scooter or wheelchair is to be used on the sidewalk, and, as should be obvious, you should never ride while drunk. Looking for an motor vehicle lawyer? Call us.